A white karate gi is also acceptable for Luke as there is evidence in “Dressing the Galaxy” book and I quote. 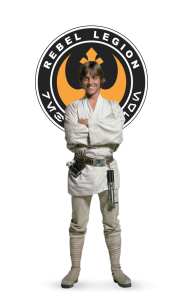 Quote: Luke had a Japanese jujitsu shirt, britches of brush denim, all in very pale colors, and his boots had puttees to be wound around his legs. from John Mollo who was the costume designer of ANH. This however is the only Jedi/costume that a gi is acceptable in. As it is the only costume that has really ever used a Gi in the movies. A Gi is not acceptable in any other Jedi costume. 2. 2″ Wide Brown Leather Belt with Rectangular Silver, Marked-Up Buckle, 1 D ring lightsaber hook, Belt Pouches: 2 Brown Ammunition Pouches, 1 Long Tool Pouch, 1 Triangular Pouch. 4. Tan ankle length shoes (no laces) – preferably suede or canvas, w/matching puttees (leg wraps) ankle to knee. 6. Characters’ hair needs to be a “similar” style to that of Luke Skywalkers’- no buzz cuts or beards also. 1. Light brown poncho with dark brown trim. 2. Light tan floppy hat and black framed aviator goggles w/black strap. 5. Luke’s ANH hero lightsaber hilt.